5/8" Thickness. 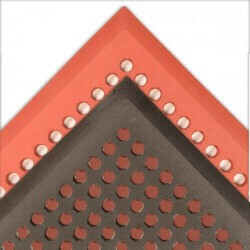 Comfort Zone® is made from a solid rubber compound featuring a large hole drainage system and a textured top surface that facilitates drainage and minimizes slippage. Broad beveled borders on all four sides are an integral molded part of the mat reducing trip hazards and making it the perfect choice for applications where workers are moving on and off the mat frequently. 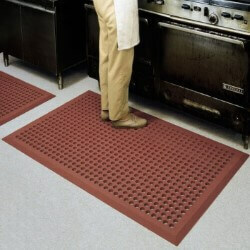 Manufactured with MicroStop™ anti-microbial rubber compound (Red only). Production time: 3 to 5 business days. 1. 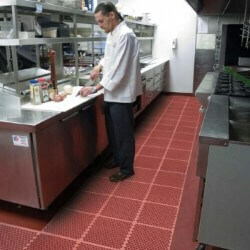 Manufactured with MicroStop™ anti-microbial rubber compound that inhibits the growth of bacteria and fungi to provide a cleaner and healthier work environment (Red only). 2. Available in general purpose (Black) and heavy-duty (Red) rubber compounds for varying degrees of grease and oil protection. 3. 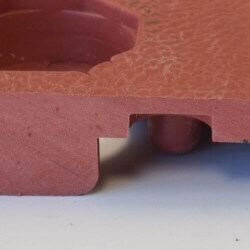 Molded-in beveled edges to reduce trip hazards. 4. 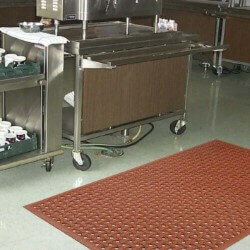 Drainage system removes liquid and debris from worker platform.